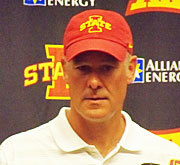 Iowa State football coach Paul Rhoads hopes the Cyclone offense can make bigger strides in the second spring practice under offensive coordinator Mark Mangino. ISU ranked eighth in the Big 12 last season by averaging just over 23 points per game. “I think there are certain parts of it that allow us to take bigger steps, at the same time there’s other pieces…the runningback group is basically fresh faces and that doesn’t allow you to leap like you would like to,” Rhoads says. The Cyclones close out spring drills with an intrasquad game on April 11th.